At LSU, there are multiple ways to share media and interactive content with your students in the form of four major platforms: Panopto, Cisco WebEx, Kaltura, and BigBlueButton. With options including embedding into Moodle as well as robust services on their own, they are the premier ways to get your audio and video content on the front stage of your student curriculum! Panopto is a video platform which includes software for recording and live streaming video, a portal for storing and managing your videos, a search engine for finding content inside your videos, and interactive video players. Panopto is a great resource for recording lectures and supplemental video tutorials to improve student learning in and outside of the classroom, and is available to active LSU faculty and staff. For more information, please see the GROK Panopto Overview. WebEx is a web conferencing software as a service that allows LSU students, currently active faculty and staff of the LSU A&M, Law Center, and Veterinary Medicine campuses to host online meetings, webinars, training sessions, and remote support. WebEx contains features for sharing your screen and applications, a whiteboard, as well as Voice over IP for a smooth end-user experience. For more information, please see the GROK WebEx Overview. 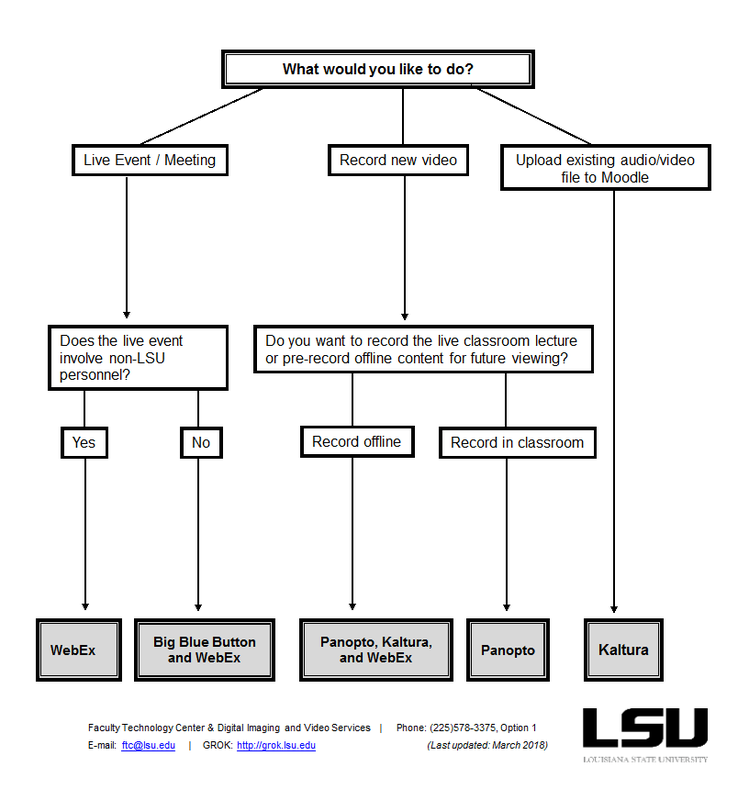 Kaltura is a tool available to LSU Faculty, Staff & Students to create, publish, embed, and distribute audio and video by adding it to Moodle courses, enabling a streamlined platform for instructor content and assignments to be all in one place. For more information, please see the GROK Kaltura Overview. BigBlueButton is an open source web conferencing program for online learning that is supported on all major platforms including Mac, Linux, and PC. It allows presenters to teach students using real-time document sharing (PDF or any office document), webcams, chat, desktop, and audio. For more information, please see the GROK BigBlueButton Overview. For a thorough comparison of these three services, please see the Digital Media Quick Reference Guide.